Meatball Sub Casserole - only 6 ingredients and ready in 30 minutes! french bread, cream cheese, Italian seasoning, frozen meatballs, spaghetti sauce and mozzarella cheese. 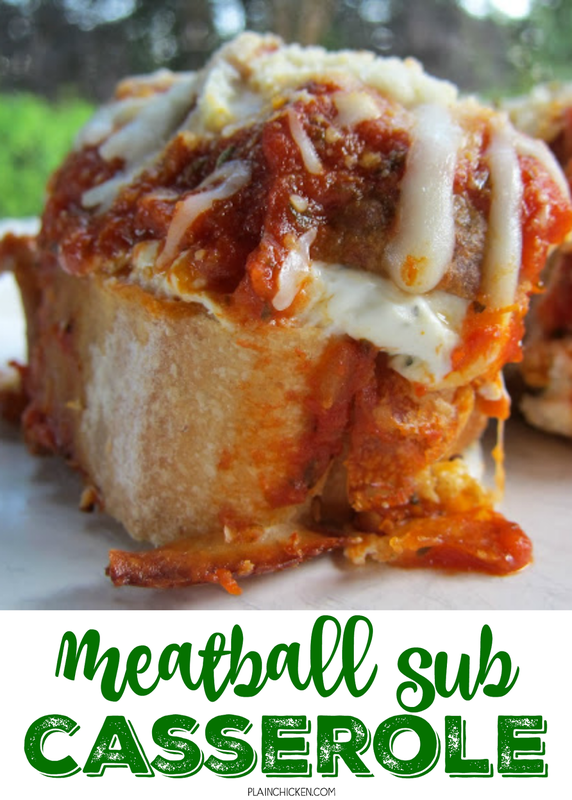 French bread topped with a yummy seasoned cream cheese, topped with meatballs, spaghetti sauce and mozzarella cheese. 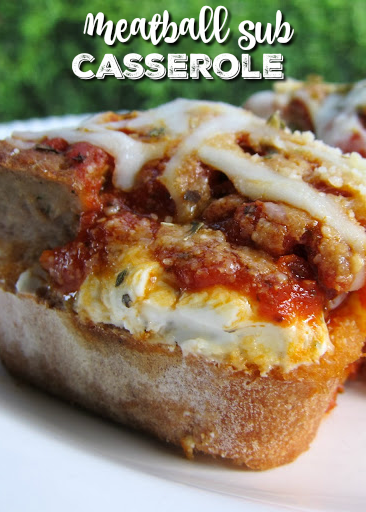 Everyone LOVES this casserole - especially the kids!! It is SOOO good! A fun twist to pizza night! A few weeks ago I made a Meatball and Ricotta Pizza. We absolutely loved it! I had some leftover meatballs and decided to make this casserole with them. It is very similar to one of my favorite dips - Pizza Dip. Pizza Dip is layered dip of cream cheese, pizza sauce and cheese. It is served with french bread slices. This casserole puts it all together in one dish and adds meatballs for a comforting meal. This was so simple and tasted fantastic. This dish feeds a lot and would be great for a potluck. If you want to assemble this ahead of time, I would wait to add the spaghetti sauce until you were ready to bake it. I think the bread would get too soggy otherwise. We both loved this casserole. I am already planning on making this again next week! Slice french bread into 1-inch slices and place in a lighly greased 9x13-inch pan. Mix together cream cheese and Italian seasoning. Spread over french bread. Chop meatballs and sprinkle over cream cheese mixture. Pour spaghetti sauce evenly over meatballs. Top wtih mozzarellla cheese. Bake 25-30 minutes, until bubbly and cheese is melted. Cream cheese rather then ricotta cheese? Let me know what you think. 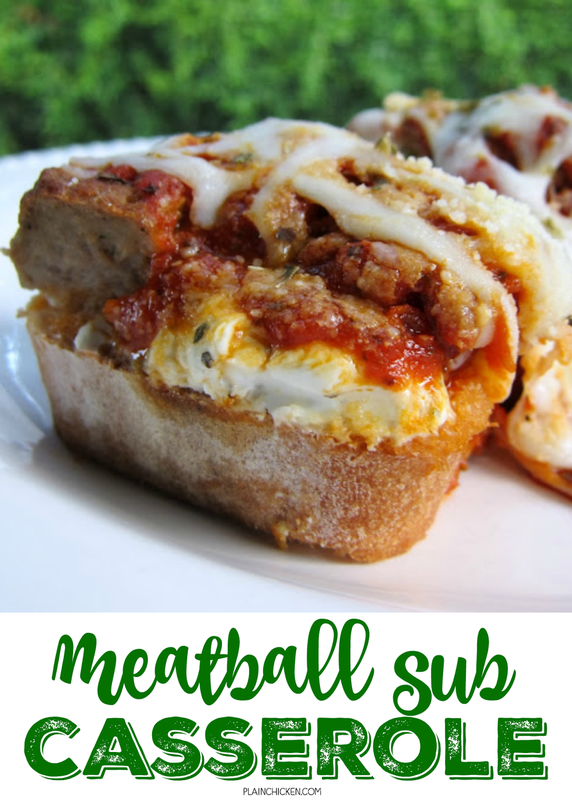 This looks yummy and I don't even like meatball subs...I'm gonna have to give this a try!! It does look yummy! I luv meatballs and meatball sandwiches. Looks like I know what I'm having for supper tonight. Love your blog!! I just found your website yesterday, but I am obsessed, and possibly your biggest pinterest supporter :) Thanks for another great looking recipe! Hey, do you mind submitting your photos to http://www.foodporn.net to make others hungry? Looks fantastic!!! Love meatball sandwiches!!! This makes them so much easier and neater to eat. Does this travel well? I was wondering how long it would be before the bread would get soggy. I make a sausage sandwich casserole just like this. I use my homemade sauce though. Made this tonight and hubby LOVED it! Will definitely be making this again. Super easy! I didn't have frozen meatballs so I subbed ground beef that I browned up. I then added seasonings to it (garlic, onion, parmesan cheese, oregano, and basil) like I would if I was making meatballs. It was quick and easy. Made this last night...subbed in an Italian cheese blend for mozzarella and added some chopped garlic and onion powder to the cream cheese. What an awesome dinner! Quick, filling and comforting all at the same time. Thank you! WOW!! I need this dish to be in my belly NOW!! It looks amazing! My neighbor made this and brought it to our Halloween pot-luck. It was amazing! The cream cheese is the perfect addition. Delicious! Made this tonight, very good. Thank you so much for the newest addition to our menu rotation! Made this tonight and it was delicious! We had meatball subs the other night so I used the leftover hoagie rolls instead of french bread. I made it smaller (11x7) and only used 8oz cream cheese. My 4 year old who refused to eat the meatball sub the other night practically licked his plate tonight because he liked it so much! Great recipe and it will definitely be added to our monthly menu plan! I made this last night, everyone loved it! Instead of Italian Seasoning I used a little dried basil and minced garlic. Next time I think I'll toast the bread first, but it was delicious and so easy! So glad you enjoyed it Jay! I was wondering about the bread getting soggy. How many of you experienced this? I can't stand soggy bread, so that would be a deal breaker for me. My bread wasn't soggy - if you are concerned about it, put the bread under the broiler for a minute before assembling the casserole. Hi Steph- I love your recipes and especially this one. Just wondering if you have ever tried freezing it for later? I am considering making it for friends that just had a baby. Thanks! Hey Jody! I haven't frozen this particular casserole, but it should be fine to freeze. Was everyone else able to fit the whole 16 oz French Bread? I squished in, but I am not sure that is how it was to be done. Why not just use a bigger dish or half the amount of bread?